Lunar cycle provides starting point for outdoors discussions at the monthly Moon Over West Linn events. The next event is March 20. 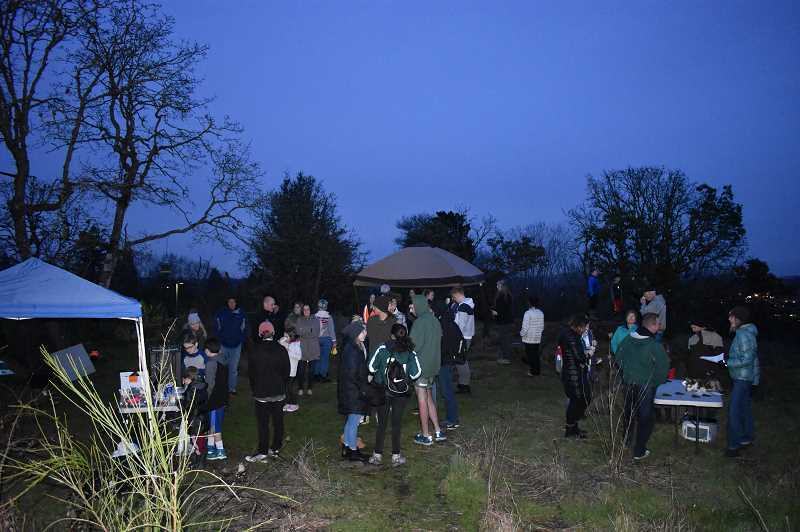 West Linn Parks & Recreation, in conjunction with Beaver Ambassadors has slated a series of Full Moon over West Linn events for 2019, starting with the full moon on March 20. The event begins at 6:30 p.m. at Camassia Nature Area, 4800 Walnut St. in West Linn. The objective of the event is to provide more natural education to the West Linn community, using the natural cycle of the moon as a jumping off point to discuss other natural cycles and processes. "The natural phenomenon of moon cycles has impacted every living thing for billions of years," said Steven Murschel, aka Esteban, who runs the environmental outreach program. "A simple act of looking up into the night sky has imparted on people a spiritual sense of wonder and awe for our entire existence. Today, modern civilization tends to approach our nearest celestial body much more scientifically, which may minimize our spiritual connection to the moon, but it shouldn't." Murschel explained that tides are a great example of how the moon impacts Earth. "Gravitational forces from the moon pull large bodies of water across Earth to and fro like a massive pendulem," he said. "The low density of water relative to rock and earth allows us to visualize this gravitational force much more clearly." He says plants and animals have learned how to use tidal influence to their advantage. And some land animals respond to the presence of the moon in ways more difficult to quantify. "Reports include badgers that actively avoid the glow of full moons, dung beetles that increase efficiency under the brighter night light, and some scorpionis that glow under moonlight causing them to forgo their nightly scavenging behavior during clear full moons," Murschel says. Biologists continue to collect data and contemplate how these species relate to lunar cycles and why they display certain traits. Murschel says its easy to see why the moon imparts a sense of mysticism in humans. "Here in Oregon, the sun will always pierce through the sky no matter how thick gray clouds conceal the day sky," he said. "But I can — and have — gone winter weeks without seeing the moon, without giving it a second thought. ... Sometimes I will be arriving home late when suddenly it seems like the clouds break in the heavens, and there it is — awe-binding and glorious! Before dipping back behind the clouds the sheer intensity of sudden brightness always seems to speak just to me. 'I am here. I am never going away. And you shall not forget.'" Murschel says the March full moon is commonly referred as the Worm Moon, but some indigenous Kalapuyan tribes related the March full moon to the digging of camas, one of the most important root crops for Pacific Northwest Native Americans, providing a major source of carbohydrates for their diet. Camas bulbs can be fire-baked to make a sweet and nutritious staple. In some places in the Northwest, camas was so common that non-Indian travelers would mistake the plant's blue flowers for distant lakes. All are welcome to attend the Full Moon over West Linn event. The free event will take place at Camassia Nature Area starting at 6:30 p.m. March 20. The next Full Moon over West Linn is April 19. Learn more online at https://westlinnoregon.gov/parksrec or beaverambassadors.com.